The lower power consumption in particular could point to potentially slimmer notebooks with removable or upgradeable MXM 3.0b GPUs in the future. 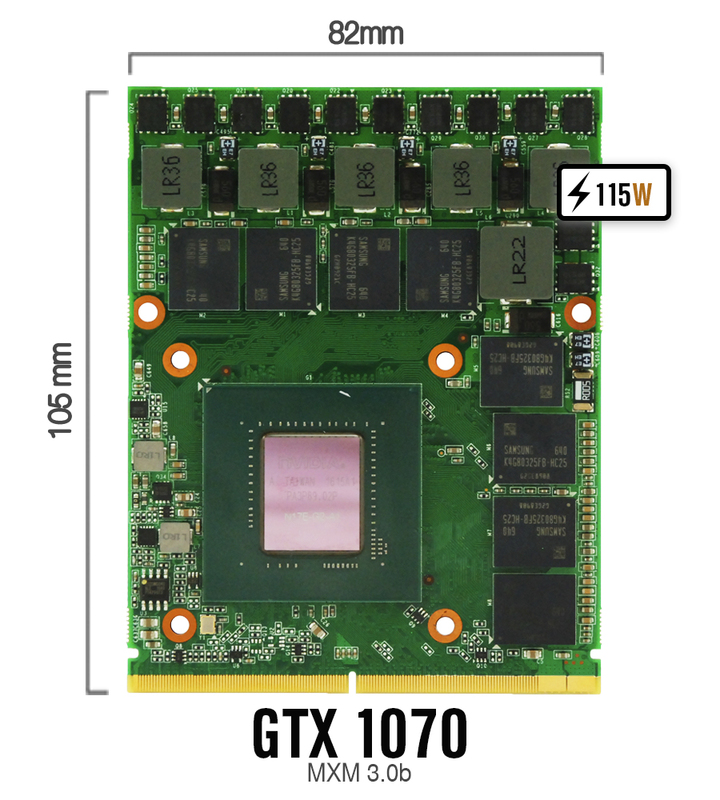 Like PCIe desktop graphics cards, MXM laptop graphics cards come in a variety of sizes with more powerful GPUs normally being larger than the less demanding ones. The 150 W GTX 1070 and 190 W GTX 1080 in certain Eurocom notebooks, for example, are often 100 x 124 mm or slightly larger than the 82 x 105 MXM 3.0b standard due in part to the higher number of RAM and auxiliary modules necessary. Less powerful GPUs like the GTX 1050 are often even smaller at 82 x 70 mm. The latest launch from the company is an 82 x 105 mm GTX 1070 MXM 3.0b card designed to fit into older laptops that may have tighter MXM 3 bays. More specifically, the manufacturer intends to make it compatible with the years-old Panther 5 and Scorpius 3D2. The card will be less demanding as well at 115 W to better accommodate notebooks with less efficient cooling or smaller AC adapters. Raw performance is a bit slower than a "proper" GTX 1070 for notebooks according to the manufacturer. Its Graphics score of 20913 points in 3Dmark 11 is 9.7 percent lower than the same GPU in the Eurocom Sky MX5 R3 (23170 points) and 19.9 percent slower than our MSI GTX 1070 desktop reference (26098 points). Perhaps more notably, its 3DMark 11 score is much closer to the Zephyrus GX501VS with its GTX 1070 Max-Q (20240 points). Users can expect overall performance to be more in line with the GTX 1070 Max-Q than a full-fledged GTX 1070 found on larger gaming notebooks including those from Eurocom. No word yet on when Eurocom will begin shipping notebooks equipped with the smaller GTX 1070 MXM 3.0b card or if a smaller GTX 1080 MXM 3.0b card could also be in the works. Aetina, for example, already offers the GTX 1080 MXM in a slightly larger 82 x 113 mm design. Specialized upgrade kits are a possibility for those who wish to update their existing Eurocom notebooks with Pascal.